Standing on the Atlantic side of the Florida keys, a sailor asked long-distance swimmer Diana Nyad to stick her tongue out, and report the taste. “We definitely tasted something grainy, crunchy, you know…” Nyad assumed it was salt, and told the sailor as much. She was corrected: “No. It is the Sahara dust,” she was told, sand grains that had blown from Africa clear across the ocean. 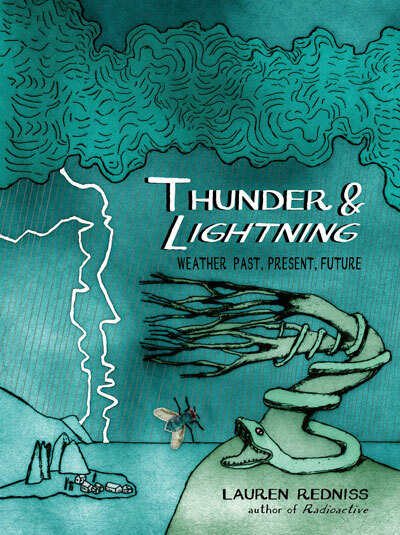 Lauren Redniss weaves Nyad’s story into her new book Thunder and Lighting, a spellbinding mix of visual art, science and history that beautifully articulates the many dimensions of weather. She uses the Saharan dust crossing the Atlantic as a means to explain global wind patterns, those that jets fly along and temper local climates. Within the section on wind alone we get Nyad alongside Herman Hesse and Raymond Chandler, a bit of Greek Mythology, and the tale of a geoengineer working to use wind to cool the Grand Mosque at Mecca. Genre blending, time jumping and scientific speculation are all fair game here. We at Wordstock are excited to host a lunchtime conversation on nontraditional storytelling with Lauren Redniss, a joint collaboration with Tin House Books deemed “Unconventional History: Past, Present and Future.” The talk will include Luc Sante and Zach Dundas, both of whom tell unexpected stories about places and people we think we know. Later in the afternoon we will host an exciting conversation between Diana Nyad and Cheryl Strayed, where Nyad will discuss her new memoir, the chronicle of an unwavering spirit in the face of seemingly great natural barriers.